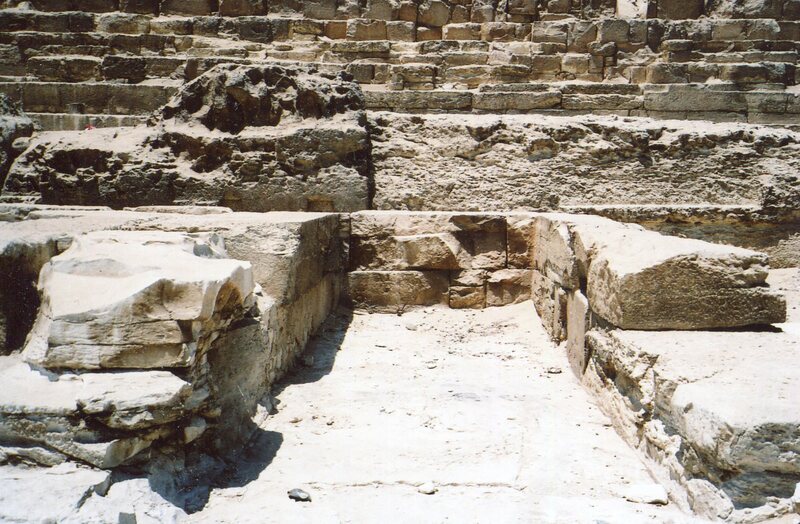 As the pharaohs built their pyramids at Giza, another major architectural form was developed. 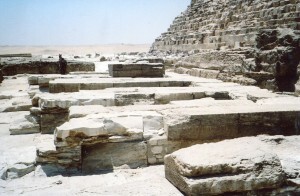 It later replaced the pyramid as ancient Egypt’s main type of royal construction project. The above shot’s from the inside of King Khafre’s valley temple. It’s one of three temples associated with his reign. 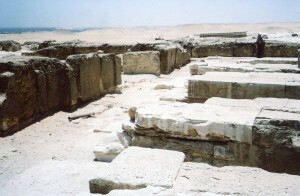 Ancient Egyptians increasingly devoted more resources to temple construction, and temples later became their largest buildings. 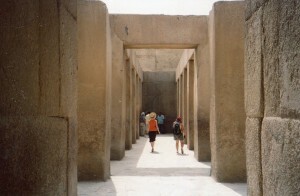 Khafre’s temples were huge advancements in this direction. We’ll briefly look at each temple. 1. The valley temple is one of the two temples on the water front, where boats from the Nile docked. 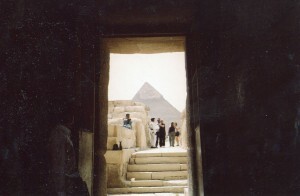 The above photo looks towards Khafre’s pyramid. The Sphinx is to the right. The valley temple’s 2 main rooms form a T, and the bottom of the body faces the pyramid. So I’m standing in the middle of the crossbar. The first picture looks askance within the body. The body’s aesthetics are very linear, simple and stately. As ancient Egyptians developed their temple architecture, they did it in terms that reflected the Nile’s flow and the pyramids. They didn’t go for the abundance in Indian art. Mark Lehner wrote that 23 statues of Khafre presided in pits in the crossbar, and that they might have formed a cosmic circuit. The pit at the center of the leg is wider than the others, and he thinks that its statue might have been counted twice. He wonders whether each statue was honored at a certain hour, or whether a deified part of the royal body presided in each statue. In either way, a procession through the crossbar had the same grand linear quality as the body. Both rooms are very stately, and they’re well worth lingering in. 2. 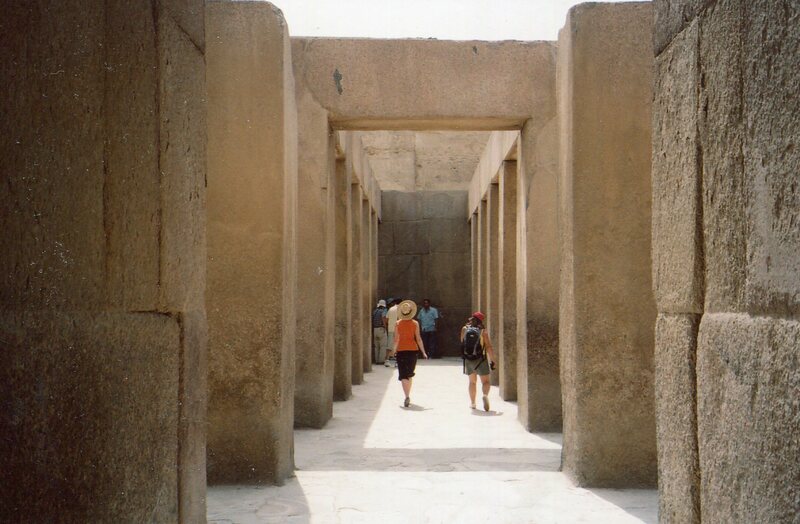 After paying my respects, I exited through the door that faces Khafre’s pyramid. The Great Sphinx, and the Sphinx temple are just to the right. The temple’s not nearly as well preserved as the valley temple, and it wasn’t open. It had two sanctuaries–one in the east (facing the Nile), and one in the west (towards the pyramid). Lehner wrote that both were associated with the rising and setting sun. 3. The third temple is above. 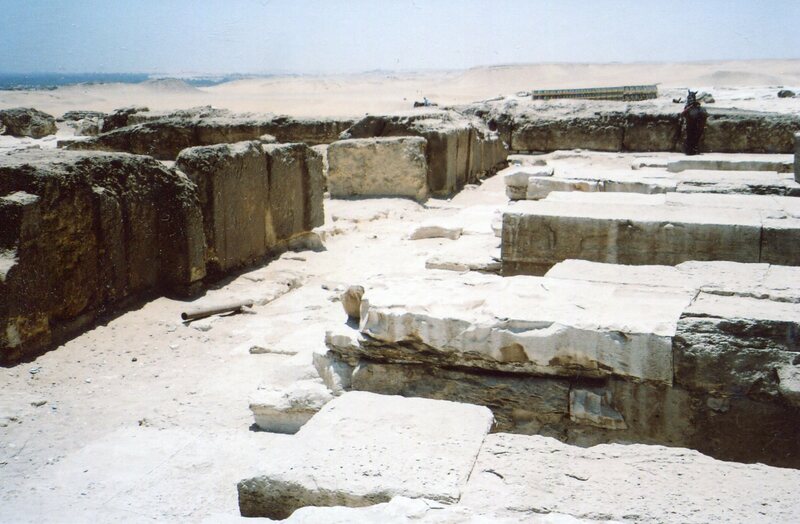 It’s the mortuary temple, at the base of Khafre’s pyramid. It begins with a similar T configuration as the valley temple’s. Then there’s an open court. Then there’s the back room, with 5 large niches–which is where I’m standing in the above shot. 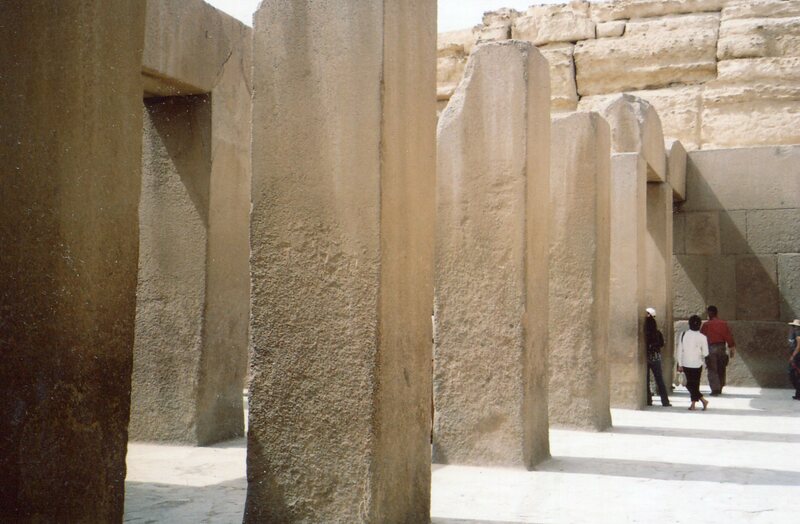 I’m in the same room in the above photo, facing a niche and looking towards the pyramid towering over me. This was the first temple to have 5 main features that later mortuary temples had. I already walked through the first three: the entrance hall (the T shaped room in this case), the open court, and now this room with the niches. Behind the niches are storage rooms and an inner sanctuary. Above, is another photo from the same room with the niches. So all 3 temples combine linearity and majesty. They’re all oriented to the rising and setting sun, and to the pyramid’s direction from the Nile (to the west of the Nile, where the first two temples are)–where the Pharaoh attained eternity and ensured Egypt’s eternal well-being. The pyramids alone expressed this network of ideas, but the new temples expressed it horizontally–the dimension in which people walked and could offer libations, incense and hymns to statues. Ancient Egyptians were creating more humanized art. They were doing this at the same time with statues. 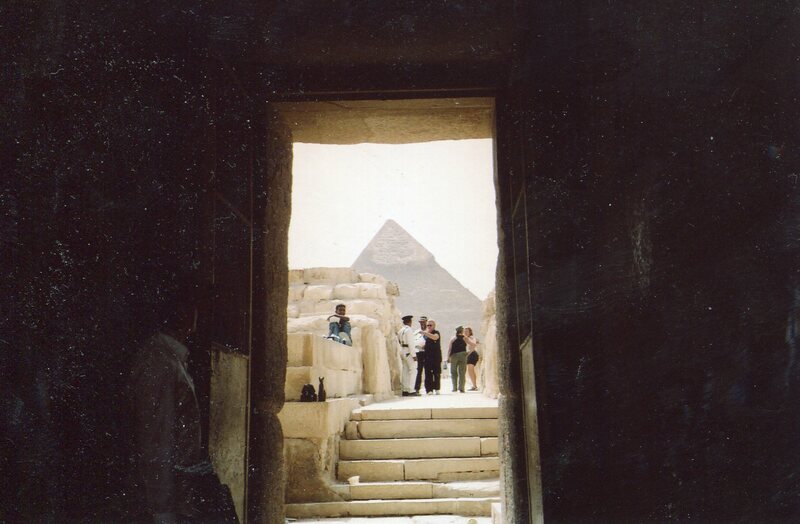 So the entire pyramid-temple complex that Khafre built forms a unity, as Khufu’s Great Pyramid next door did. If you can go there, stay at each site for a while and take the whole in.